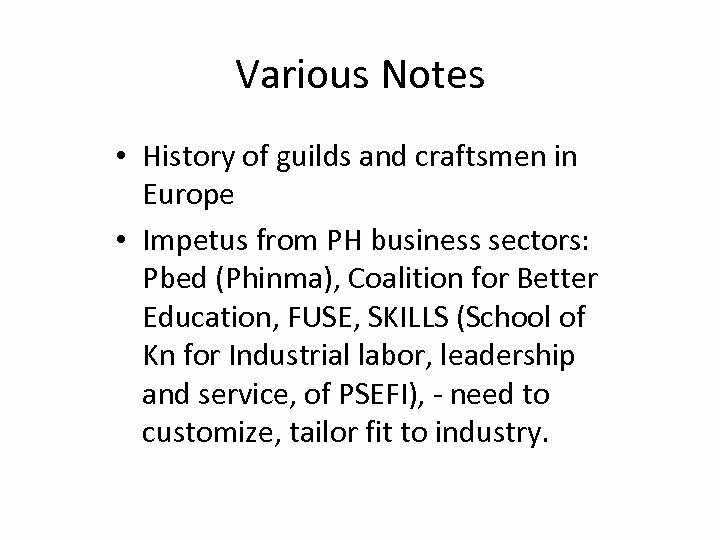 Various Notes • History of guilds and craftsmen in Europe • Impetus from PH business sectors: Pbed (Phinma), Coalition for Better Education, FUSE, SKILLS (School of Kn for Industrial labor, leadership and service, of PSEFI), - need to customize, tailor fit to industry. 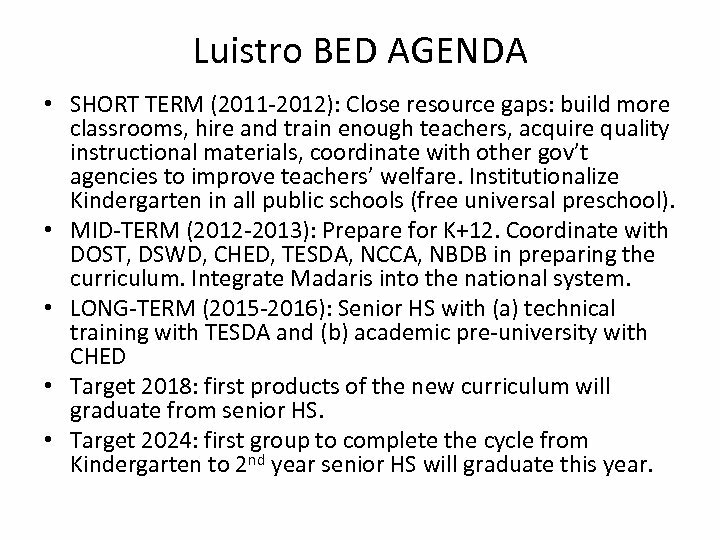 Luistro BED AGENDA • SHORT TERM (2011 -2012): Close resource gaps: build more classrooms, hire and train enough teachers, acquire quality instructional materials, coordinate with other gov’t agencies to improve teachers’ welfare. 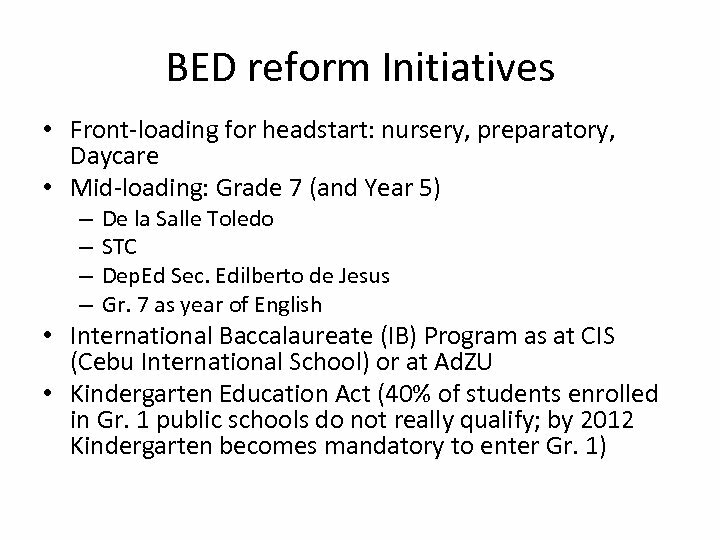 Institutionalize Kindergarten in all public schools (free universal preschool). • MID-TERM (2012 -2013): Prepare for K+12. Coordinate with DOST, DSWD, CHED, TESDA, NCCA, NBDB in preparing the curriculum. 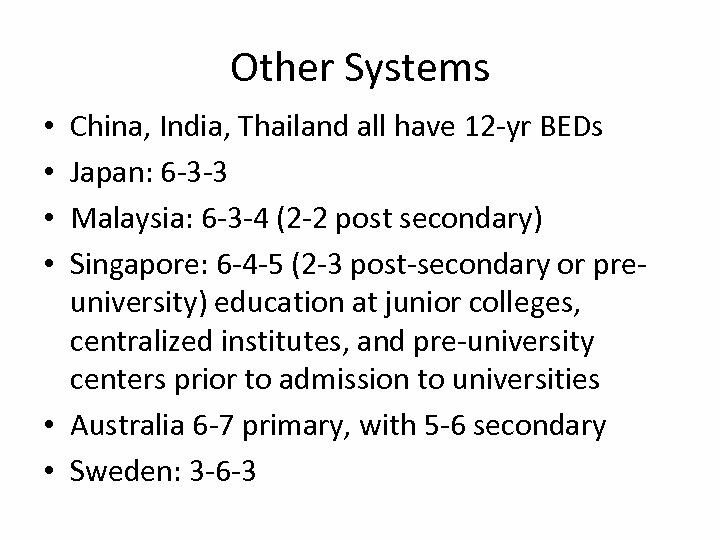 Integrate Madaris into the national system. • LONG-TERM (2015 -2016): Senior HS with (a) technical training with TESDA and (b) academic pre-university with CHED • Target 2018: first products of the new curriculum will graduate from senior HS. 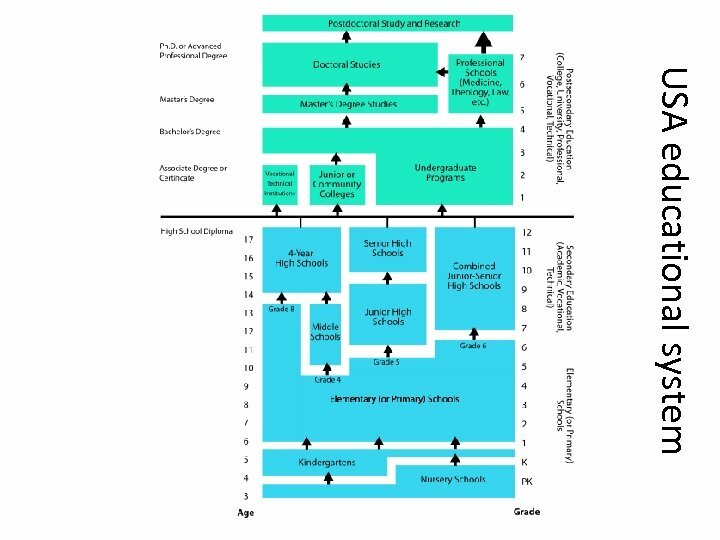 • Target 2024: first group to complete the cycle from Kindergarten to 2 nd year senior HS will graduate this year. Partnership Samples between Voc. 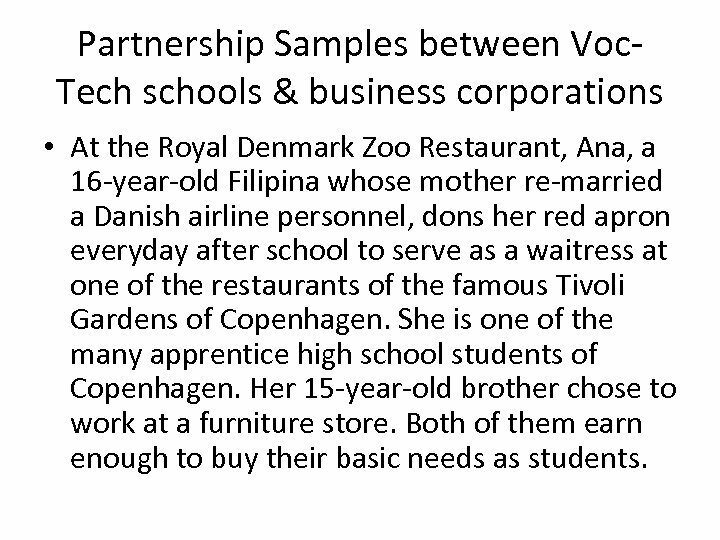 Tech schools & business corporations • At the Royal Denmark Zoo Restaurant, Ana, a 16 -year-old Filipina whose mother re-married a Danish airline personnel, dons her red apron everyday after school to serve as a waitress at one of the restaurants of the famous Tivoli Gardens of Copenhagen. She is one of the many apprentice high school students of Copenhagen. Her 15 -year-old brother chose to work at a furniture store. Both of them earn enough to buy their basic needs as students. 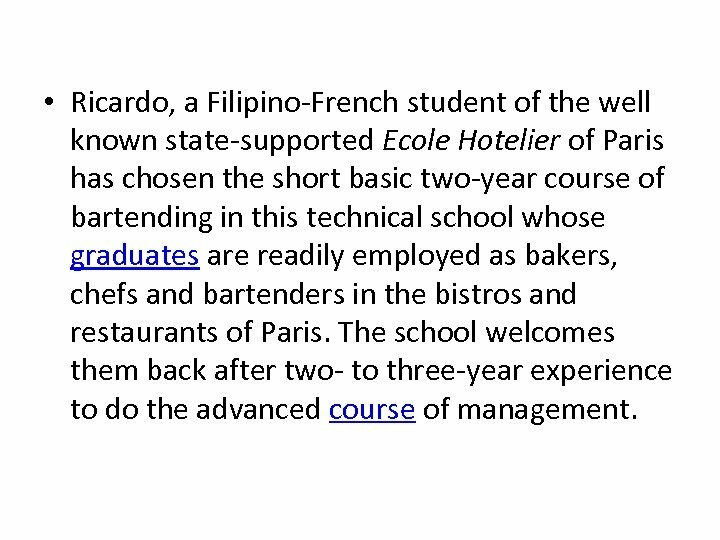 • Ricardo, a Filipino-French student of the well known state-supported Ecole Hotelier of Paris has chosen the short basic two-year course of bartending in this technical school whose graduates are readily employed as bakers, chefs and bartenders in the bistros and restaurants of Paris. The school welcomes them back after two- to three-year experience to do the advanced course of management. 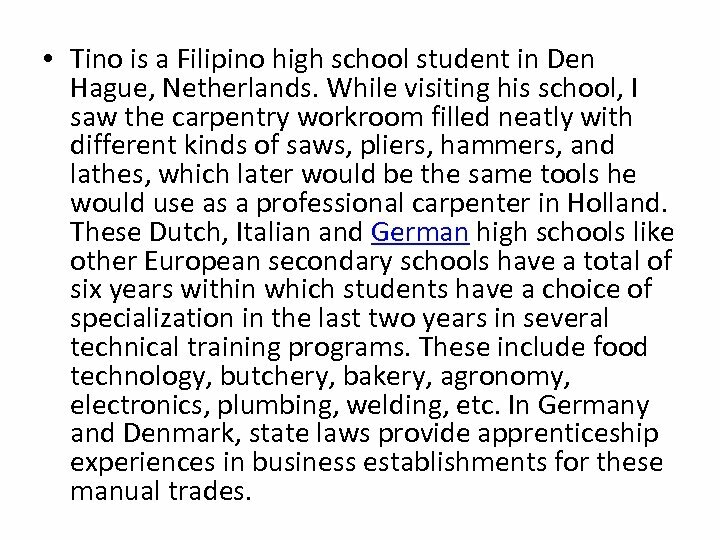 • Tino is a Filipino high school student in Den Hague, Netherlands. 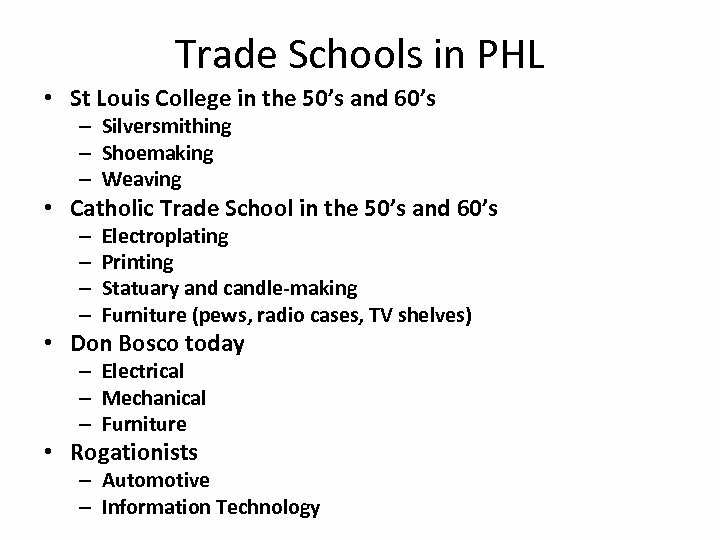 While visiting his school, I saw the carpentry workroom filled neatly with different kinds of saws, pliers, hammers, and lathes, which later would be the same tools he would use as a professional carpenter in Holland. 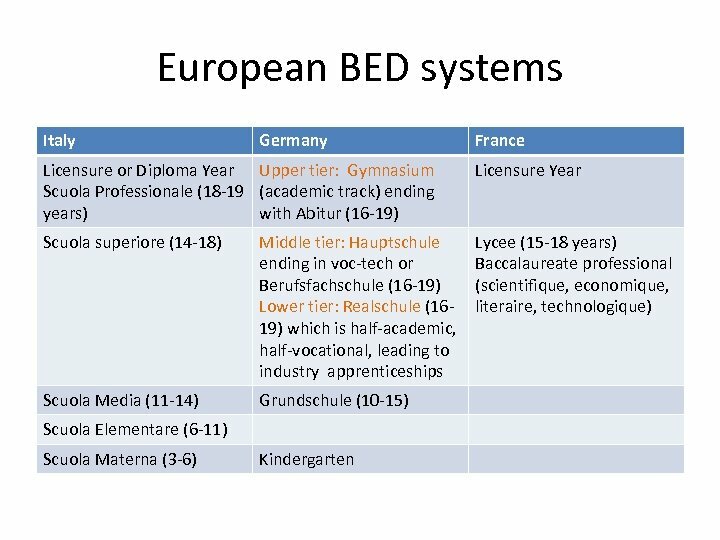 These Dutch, Italian and German high schools like other European secondary schools have a total of six years within which students have a choice of specialization in the last two years in several technical training programs. These include food technology, butchery, bakery, agronomy, electronics, plumbing, welding, etc. In Germany and Denmark, state laws provide apprenticeship experiences in business establishments for these manual trades. • The first Australians had to clear up the numerous forests to set up the first towns and villages. The British crown sent brides for the British convicts they sent here as the first settlers. Rural schools which taught agronomy provided practical education for their children. To this day such schools are still existing like the Royal High School Academy of Melbourne, the Rural Agricultural High School of Adelaide and Saul’s Farm school in Sydney. Here, high school boys and girls learn the poultry business and animal husbandry, winning awards in sheep fleecing competition. During the World’s Fair at Tsukuba, in the suburb of Tokyo, senior high school boys and girls in workers’ uniform attend to the shitake mushroom farm in the conifer forest where hundreds of shiny shitake are growing on the fallen pine tree trunks. 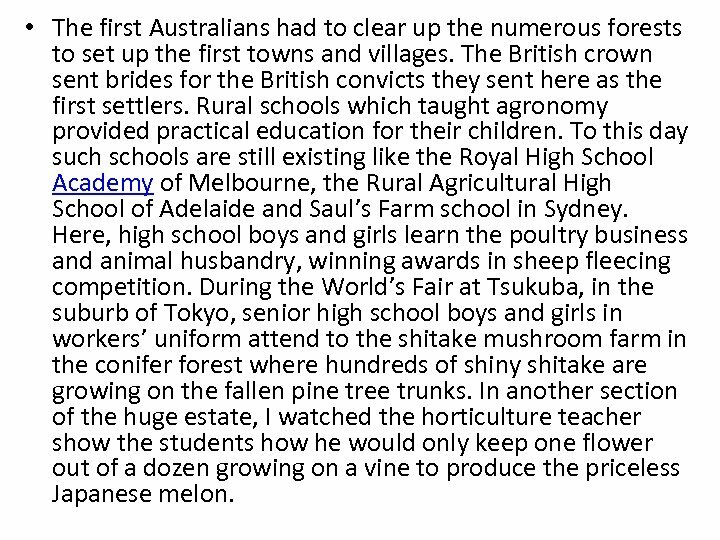 In another section of the huge estate, I watched the horticulture teacher show the students how he would only keep one flower out of a dozen growing on a vine to produce the priceless Japanese melon. A challenge to our corporate businessmen to develop quality workmanship • Would our businessmen and industrialists help revolutionize the working force of the country? Do they have the heart and therefore care for the people on whom they depend for business? If they do, must not only provide the material needs, but also the learning opportunities for young adults. • Source: Preciosa Soliven, “P-Noy's K-12 plan must first overcome BEC deficiencies, ” in A Point of Awareness, in Philstar, Oct. 14, 2010. For longer-term reflection • What is the national Vision, if any? Do we have a broad-based consensus on the same? What does the Pnoy Roadmap look like? Are we on board that agenda? • What are the development needs of R 7 in the social, economic, political, technological, cultural, religious and other areas? 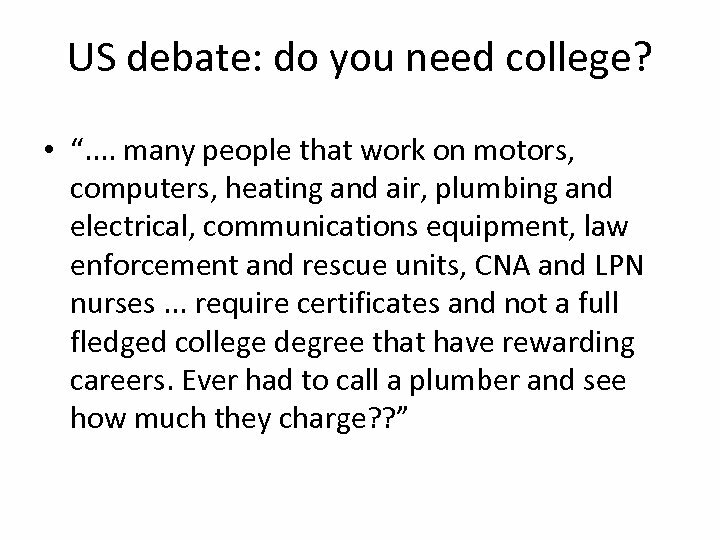 How should the educational system in R 7 address those issues? 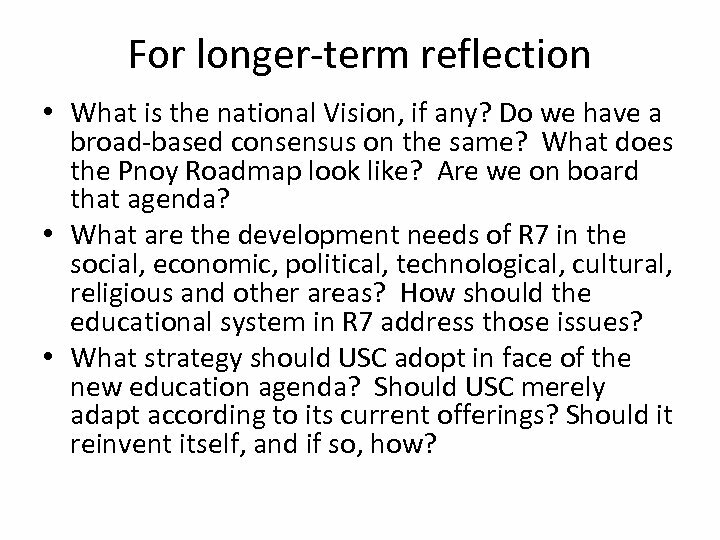 • What strategy should USC adopt in face of the new education agenda? 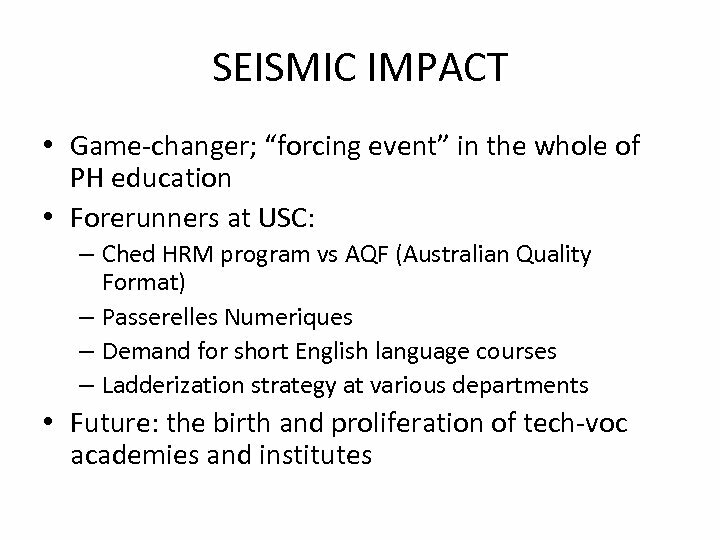 Should USC merely adapt according to its current offerings? Should it reinvent itself, and if so, how?